Numerous original and added entries show that this calendar was intended for use at Tewkesbury Abbey. 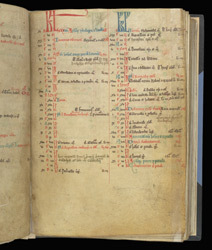 An added entry in dark brown ink in the second column, at 8 February, records the death of 'Hugh Despenser, formerly the patron of this place': Hugh Despenser died in 1349 and is buried in Tewkesbury abbey, where his fine tomb still survives. In the left column, at 17 January, is 'O. ysabel com. ': the obit of Isabelle, Countess of Warwick, the last of the Despensers, who built the Beauchamp chapel for her husband, Richard Beauchamp, Earl of Abergavenny and Worcester.